Enlarge / Let’s brew some potions! Last summer, the board game Die Quacksalber von Quedlinburg won a major award from the German press, and buzz was big on both sides of the Atlantic. 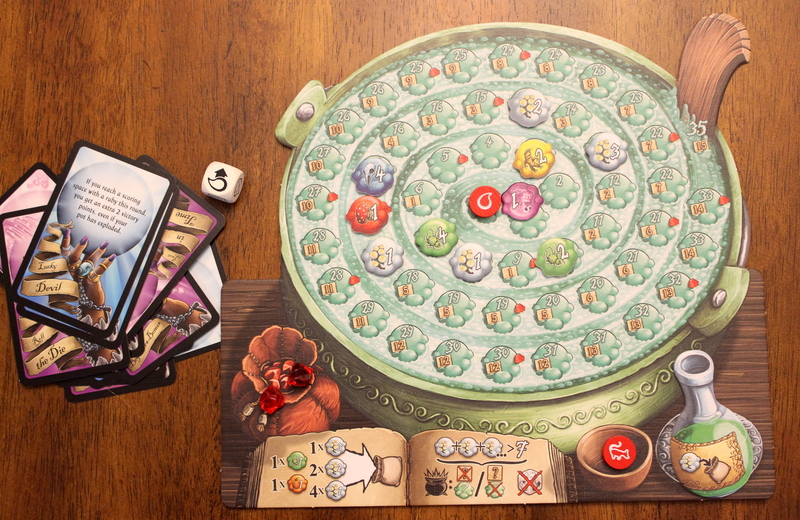 Now out in English as The Quacks of Quedlinburg from North Star Games, we’ve finally had a chance to put this bag-building, press-your-luck game through its potion-making paces. In Quacks, you play one of the titular quacks, a dubious doctor brewing and selling your wares at a pleasant-looking German festival. The festival runs for nine days, so you have nine chances to brew up something potent using ingredients pulled blindly from your bag o’ goodies. Pumpkins, crow skulls, toadstools, mandrakes, spiders, and even rat tails are positive contributions to the cauldron. But draw too many of the white “cherry bombs” (don’t ask—the picture on these chips appears to show snowberries) and your potion will explode—which means you lose out on some of the end-of-round goodies. But if you don’t push your luck, at least a little, you run the risk of being out-potioned by your fellow charlatans. The combination of straightforward, exciting gameplay with so many small additions and variants gives you plenty to think about beyond the basic “should I pull another chip from my bag” question. You have to decide how to build your bag in a given game, buying up ingredients that combo well together or that steer you in a specific strategic direction. You have to decide if you value rubies and flasks or if you prefer to live without a safety cushion. And is it more profitable to hang right behind the leader until near the end? Quacks is not a deep strategy game. But it is a terrific press-your-luck, choose-what-goes-in-your-bag experience. I have loved every minute of my playtime so far because everything about the Quacks experience is distilled “essence of fun.” Nothing is baggy or extraneous. There is no downtime, nor does game length increase much with player count. (Players all build their potions simultaneously, drawing ingredients as quickly as they like.) And the artwork is great. No, Quacks is a game of shouts and sighs, laughter and table-pounding. Its soundtrack isn’t silence but something more like “Draw draw draw YES draw CRAP draw draw draw YES draw YES raw BOO Draw draw draw DAMN YOU, CHIPS draw draw I SHOULDN’T DRAW AGAIN draw I SHOULD DEFINITELY STOP draw I BUSTED!” It’s fast, it’s fun, and penalty for busting isn’t so onerous that you’ll just want to quit the game, convinced you can never win. Unlike the potions you brew during player, Quacks won’t blow up in your face. Highly recommended—and if you like it, an expansion is coming this summer.